When you go out to eat at a restaurant, you might have noticed that the different taxes and charges in the bill outnumber items that you ordered. Now be prepared to find another entry to this already long list. A new cess has been implemented from 1 June, the Krishi Kalyan Cess, and it is being levied at the rate of 0.5% on all taxable services, including restaurant bills. This cess is levied to collect funds for development of the agriculture (krishi) industry. So, if you frequent restaurants, your cost of dining is set to go up. For instance, if your total bill at a restaurant comes toRs.6,000, you may end up paying Rs.7,896, post-charges and taxes, a 31.6% increase in the bill. Here’s how. Every restaurant is free to levy any amount as service charge. “Restaurants charge service charge at will. There are no rules governing this charge,” said Archit Gupta, chief executive officer and founder, ClearTax.in. Most restaurants charge 10% of the bill amount as service charge, which can be considered as tip. “It is not a statutory levy and may be charged by a restaurant depending on its internal policies,” said Tanushree Roy, director, Nangia & Co. But what if you did not like the service, do you still have to pay the service charge? Mostly yes, because service charge is printed on the menu and thus a customer is intimated about it in advance. Considering the above example, service charge at 10% would be Rs.600 (10% of Rs.6,000). Now, unlike service charge, there are a set rules on how service tax is charged. This charged at 14%, and is applicable on food consumed at air-conditioned restaurants. But it is not charged on the entire amount of the bill; it is levied only on the cost of service you have consumed. So, to separate the two components (food and services), 40% cost of the item is considered as service cost, and tax is levied on that. Effective rate of service tax comes to 5.6% (40% of 14%) on the bill amount. Moreover, service tax can be charged on the amount of service charge. Then comes the cesses. Swachh Bharat Cess and Krishi Kalyan Cess are charged along with service tax on all the taxable services, at a rate of 0.5% for each on the cost of service. Again, 40% of these, i.e., 0.2% is charged on the entire bill amount. So, in the example above, if we take total service tax as 6% (5.6%+0.2%+0.2%), it would be Rs.396 (6% ofRs.6,600). There is no clarity on whether service tax should be charged by takeaway outlets or home delivery. “There was a clarification issued that free home delivery or pick-up of food is not liable to service tax since the dominant nature of such a transaction is sale and not service. However, this clarification was later withdrawn,” said Saloni Roy, senior director, Deloitte India. “But restaurants usually charge service tax on home delivery and take away orders,” she added. Another substantial tax is value added tax (VAT). “Restaurants charge VAT on the food bill. VAT rates vary from state to state,” said Gupta. For instance, in Delhi and Maharashtra, VAT on food is charged at 12.5%, whereas in Gujarat, it is 15%. VAT can also differ based on the item. For instance, alcohol generally attracts a higher rate of VAT. In Delhi, VAT on alcoholic beverages is 20%. Also, “under the VAT laws, the tax base should be the value charged for supply of goods and all incidental charges for this supply,” said Deloitte’s Roy. So, VAT can also be charged on service charge. Though not all restaurants do so. 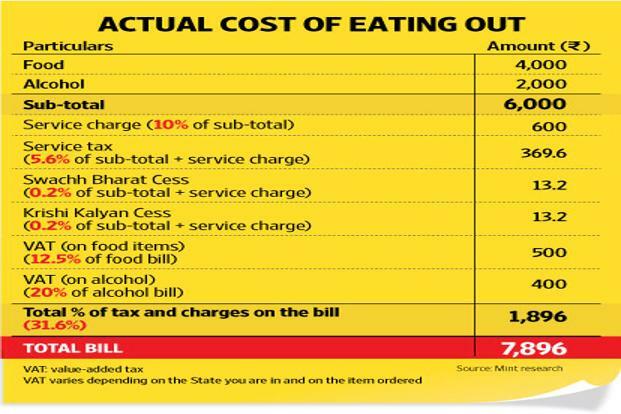 In the example above, if you dine out at a restaurant in Delhi, applicable VAT would be 12.5% of the bill, or Rs.500 (12.5% of Rs.4,000 for food) and Rs.400 (20% of Rs.2,000 for alcohol). Taking the same example as above, a person falling in the highest tax bracket (30.9%) would need to earn approximately Rs.11,500 pre-tax income to be able to pay a bill of Rs.7,986 at a restaurant. Effectively that means, to pay a food bill of Rs.6,000, she will have to earn around Rs.11,500. There is, however, a way to save some money by using meal vouchers, such as Sodexo and Ticket Restaurant, to pay for your food bills. If you choose to get such vouchers as part of your salary, no income tax applies on these.